A small pine from the dry valleys of the western Himalayas. Over-exploitation for its edible seed, coupled with conversion of forests for agricultural use and logging for timber and firewood have led to a range wide decline that is sufficient for it to be listed as Near Threatened. 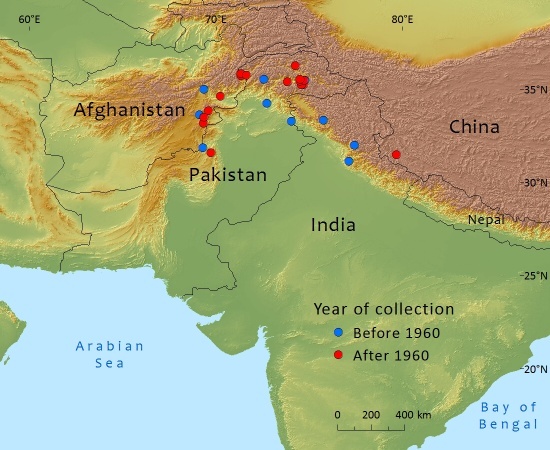 Found in eastern Afghanistan; China, S Xizang (Tibet); India, Jammu-Kashmir;and northern Pakistan. The extent of occurrence is beyond the thresholds for a threatened category. The area of occupancy for natural forests is uncertain but is likely to be less than 2,000 km², given the naturally fragmented nature of its distribution and relatively small subpopulation sizes. There are more than ten locations. The largest pure forests are in the Sulaiman Ranges in Pakistan where they cover more than 250 km². Pinus gerardiana grows in the mountains from about 2,000 m to 3,350 m above sea level. In the Himalayas this means that this pine is restricted to valley floors between very high mountain ranges, which isolate different populations to a certain extent. It prefers dry, sunny slopes where the vegetation is more or less open, often occurring on limestone. The edible seeds are evidently dispersed by birds, probably Eurasian jays. 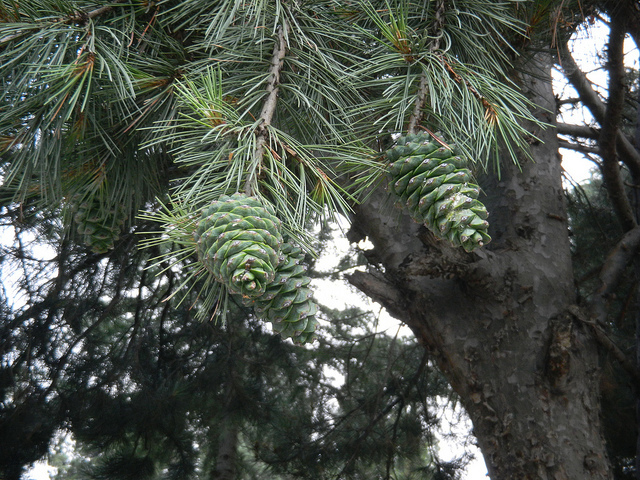 The main economic use of this pine is of its edible, oil-rich seeds (neoza in Hindi), which are harvested by knocking the cones from the trees in autumn and early winter. In some areas, local mountain clans and villages own rights to the seeds and control the harvest, which is exported to markets on the plains of northern India. In traditional systems, sufficient cones are usually left on the tree to ensure that some seed is available for natural regeneration. Trees that do not produce enough cones any more are cut as firewood and new trees are planted from seeds to maintain stock. In other areas, harvesting rights are held by private contractors: in these areas all cones are collected (Peltier and Duffay 2009). The wood is used locally for light construction and carpentry. 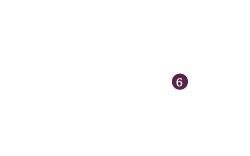 This species is comparatively rare in horticultural cultivation (despite good hardiness) and mainly restricted to collections in arboreta. Its bark is reminiscent of that of the Lacebark Pine (P. bungeana), but somewhat less decorative; the seeds of P. gerardiana are much larger and better for consumption. Pinus gerardiana forests have declined and continue to decline throughout their extensive range. While there is insufficient range wide information to quantify this decline accurately, it is strongly suspected that it is approaching at least 30%. On this basis an assessment of Near Threatened is the most appropriate, with the criteria for A2cd and B2ab(iii) being nearly met. The main threats come from over-exploitation for its seed, for firewood and timber. Overgrazing that inhibits regeneration and the conversion of forests for agricultural and pastoral use are additional threats. In Afghanistan, plantations have been established to supply the seeds. In other parts of its range P. gerardiana forests are included within protected areas. However, these forests, and many of those outside of these areas, are still subject to degradation through overgazing, overexploitation for firewood and conversion to agricultural land. A combination of reafforestation programmes coupled with sustainable use strategies are being implemented in some parts of its range such as the Suleiman Mountains in Pakistan. Kumar, R. (2015). Pinus gerardiana: ecology, regeneration and propagation. Saarbrucken, Germany: Lap Lambert Academic Publishing. 142 pp. Kumar, R., G.S. Shamet, H. Mehta, N.M. Alam, R. Kaushal, O.P. Chaturvedi, N. Sharma, B.A. Khaki & D. Gupta (2016). 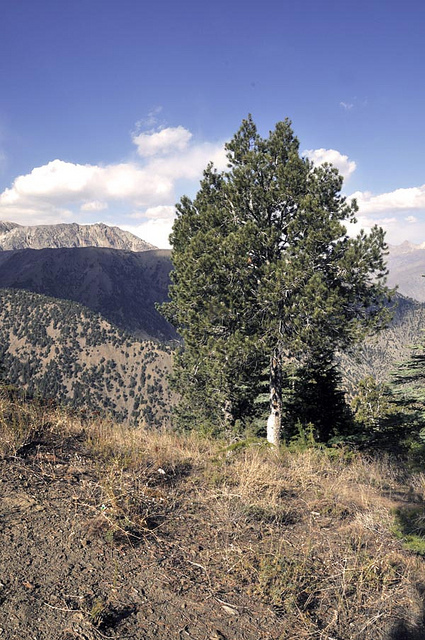 Regeneration complexities of Pinus gerardiana in dry temperate forests of Indian Himalaya. Environmental Science and Pollution Research 23:7732-7743. Kumar, R., G.S. Shamet, A. Pandey, V. Kakade, D. Dinesh, N. Sharma, D. Gupta (2016). Impact of anthropogenic disturbances on ecology of Pinus gerardiana Wall in Indian Himalaya: a review. Agricultural Research and Technology 1(3):ARTOAJ.MS.ID.55561. Urooj, R. & A. Jabeen (2015). Present status of Pinus gerardiana Wall. in Pakistan: a review. Middle East Journal of Business 10(4):46-48. P. Thomas, 2016. Pinus gerardiana, from the website, Threatened Conifers of The World (http://threatenedconifers.rbge.org.uk/taxa/details/1116).